Mossley Industrial Heritage Centre is situated in Longlands Mill, the home of Emmaus Mossley, on Queen Street, opposite Mossley railway station. The centre is very small but has a collection of old photographs for visitors to browse through as well as some artifacts from the town's history of cotton spinning. Longlands Mill was part of one of the largest family-owned cotton production mill complexes in the country when it opened. The extensive Britannia mills (which included Longloands Mill) were run by the Mayall family of Mossley. 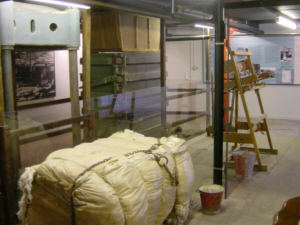 The centre was opened in an attempt to preserve a little of the town's cotton history. The baling machine in the centre is a preserved feature of the mill. The centre is usually open from 2.00 to 4.00 pm from Wednesday to Saturday. If travelling from a distance, please phone first to check. 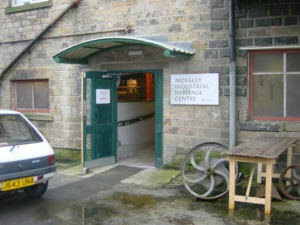 Mossley Industrial Heritage Centre is a collaboration between Emmaus Mossley and Mossley Civic Society. For more information about the Mossley Civic Society, call 01457 832813.